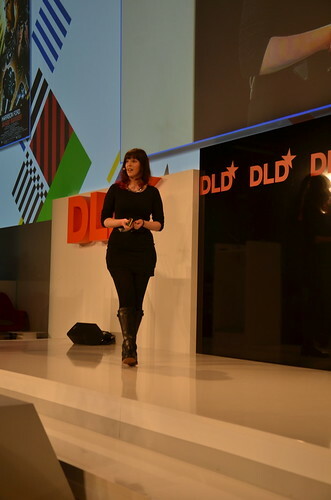 "I'm here to tell you that hackers are in control," Keren Elazari begins her afternoon talk at DLD13. "I'm here to tell you how hacking has changed everything around us." Elazari has been in the hacking industry for more than half of her life. Although she refuses to quantify her age ("I'll tell you it's a two-digit number), it seems safe to assume she has been forcing her way into systems for at least ten years. Currently she is a security teaching fellow at Singularity University, California. Elazari paces the stage as she tells the audience that technology is changing our lives. "We have robots on other planets shooting lazers. But that’s not enough, they are also tweeting about it to let us know." Anyone at DLD13 today can have little doubt that our era is truly digital. Yes, not everyone is connected to the Internet or using smartphones yet. But almost all of us live within systems which rely on technology. These days information is constantly analysed. Patterns that connect are identified every day. But Elazari asks whether information is actually power. Or whether it is having access to information. Her answer is clear. "That is why hackers are so powerful. Because they can gain access to information". Elazari's personal heroes, her role models, largely came from the world of science fiction. Among the ones she names is Neo from 'The Matrix' films and his partner, the hacker Trinity, whom Neo first thought was a man. More recently, there was also Lisbeth Salander, the elusive female protagonist from Stieg Larsson's best selling 'Millenium' trilogy. All of these fictional characters inspired Elazari's real life. "We live in the era of cyber warfare," Elazari says, pointing to a projection of the word 'Stuxnet' behind her. The worm Stuxnet showed how lines of code can have a physical impact. Elazari believes it is one of the countless examples which prove that "cyber has become the new frontier of conflict". It's an idea which is taking root. For instance, the Crupto Party – which started in Australia – is a grassroots movement of concerned civilians getting together to learn basic skills. On the governmental level, there is Israel's Pirate Party, which is competing in the election which begins Tuesday, 22.01.2013. “These guys are here to stay. But the bad guys are as well,” Elazari says. The new frontiers of hacking, according to Elazari, are human bodies and brains. We stand on the cusp of this tremendous opportunity to find out what is happening within us in real time. But in the wrong hands, hacking-know-how can also be very dangerous. "Some of us today are already hackable." People with implanted pacemakers are susceptible to hack attacks, for example.